This egg is in trouble. Evil hungry robots want to eat it, and now it must try to save its life. 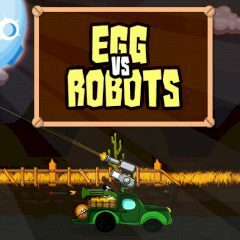 Jump behind the wheel of a toy car, take a big gun and try to help the egg shoot down all the robots it will face on its way. Are you ready to show everything you can in this shooting game? Collect powerups and earn money to buy upgrades. This egg is very tasty but brave enough to repel the attacks of everyone who will try to eat it. For example, today a crowd of hungry robots attacked the egg – they want to eat it. But our hero is not such a fool to give up without a fight! Take a big gun, jump into a toy truck and try to shoot down all those insatiable machines in this free flash shooting game which had been developed by the famous developer under the proud name KiZ10!